a generalized spinal and extraspinal articular disorder characterized by calcification and ossification of ligaments, particularly of the anterior longitudinal ligament; distinct from ankylosing spondylitis or degenerative joint disease. a form of degenerative joint disease in which the ligaments along the spinal column become calcified and lose their flexibility. Diffuse idiopathic skeletal hyperostosis (DISH) is a condition involving heterotopic bone formation and associated pain and stiffness. Radiographic and pathologic features of spinal involvement in diffuse idiopathic skeletal hyperostosis (DISH). Diffuse idiopathic skeletal hyperostosis of the cervical spine: an underestimated cause of dysphagia and airway obstruction. Cervical myelopathy caused by soft-tissue mass in diffuse idiopathic skeletal hyperostosis. Patients with spondyloarthropathy, chronic lung disease, obesity, diffuse idiopathic skeletal hyperostosis and diabetes mellitus and hypoparathyroidism that may give rise to diffuse idiopathic skeletal hyperostosis-like pictures were excluded from our study. 5) showed that of the various rheumatological manifestations adhesive capsulitis, shoulder hand syndrome, diabetic hand syndrome diffuse idiopathic skeletal hyperostosis, Dupuytren's disease and neuroarthropathy are characteristically associated with diabetes mellitus. The prevalence of diffuse idiopathic skeletal hyperostosis (DISH) in two large American Midwest metropolitan hospital populations. Diffuse idiopathic skeletal hyperostosis is characterized by the presence of ossification along the anterolateral aspect of vertebral bodies (6,7). The presence of more than two bridges between contiguous vertebrae was taken for the diagnosis of diffuse idiopathic skeletal hyperostosis (DISH). Diffuse idiopathic skeletal hyperostosis (DISH) is a disease characterized by flowing calcification of paraspinal ligaments. 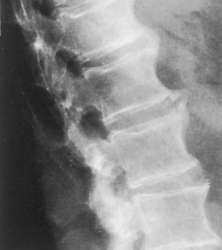 Risk factors for development of HO include: ankylosing spondylitis, diffuse idiopathic skeletal hyperostosis (DISH), posttraumatic arthritis, bilateral hypertrophic osteoarthritis, previous surgical procedures, extensive trauma occurring during an injury or an operation, and most importantly a previous history of HO formation. Diffuse Idiopathic Skeletal Hyperostosis with cervical spinal cord injury - A report of 3 cases and a literature review.